I was really excited once I figured this out and I think it is a really useful feature that lots of folks will be able to use. My hope is that once you understand this functionality, you’ll appreciate the pandas pivot table even more than you do now. 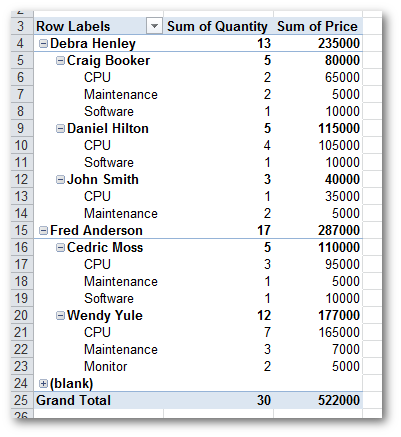 I have to believe that anyone that has created a pivot table in Excel has had the need (at one time or another) to break the data into multiple “chunks” for distribution to various people. We would really like to send a seperate report (or seperate tabs in one file) to each manager (Debra and Fred in this example). How would you do this in Excel? In my experience, I would normally just copy and paste - I’m not too proud to admit I’ve done that. Others might write VBA. There may even be other options I haven’t figured out. Bottom line: it’s a hassle. Pandas has a solution to help you out - DataFrame.xs . Have you ever heard of it? Me neither. Even after reading the documentation it might not be clear to you how useful it can be. 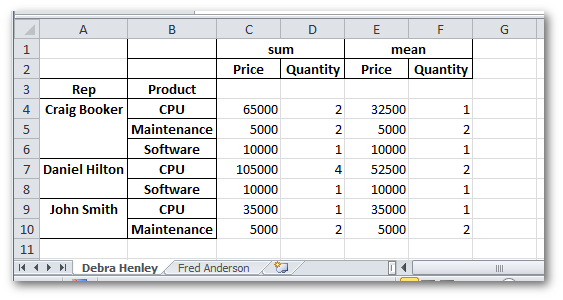 Once you understand what it does, I think you’ll immmediately see the usefulness for generating custom reports/spreadsheets from your own pivot tables using the cross-section function. The easiest way to understand xs is to show an example. I will take a data example from the pivot table article. This is fairly straightforward once you understand the pivot_table syntax. If you’re like me, you just had light bulb go off and realize that a lot of cutting and pasting you have done in Excel can be a thing of the past. Now it should be clear what we’re about to do. I’ll print it out first so you can see. We have just read in an Excel file, created a powerful summary of data, then broken the data up into an output Excel file with separate tabs for each manager. Just by using 9 lines of code! I think my excitement about this functionality is warranted. In some cases, you might want to generate separate files per manager or do some other manipulation. It should be pretty simple to understand how to do so given the examples above. The output is saved in multiple tabs in a new Excel file. There are other things you could do to this file to make it even more portable but this should give you the idea. If you are interested, I’ve posted a gist so people can make forks and update if they want. I am really excited about learning how to use this functionality to create customized pandas reports in Excel. I also found it useful to put this in a standalone python script that has sophisticated argument parsing and is robust enough that you could hand it off to a less skilled user to generate a report. So, be honest. Do you think this is as handy as I do?